CycleOps partnered with PowerTap to get the most accurate power measurement technology around built into a dedicated indoor set up. We're talking an industry leading power accuracy of +/- 1.5%. Combined with the Joule 2.0, this technology gives you all the performance data you've ever wanted. That with all the benefits of our signature frame — perfect fit, freewheel gearing, study steel — you'll be looking for excuses to get back in the saddle again and again. 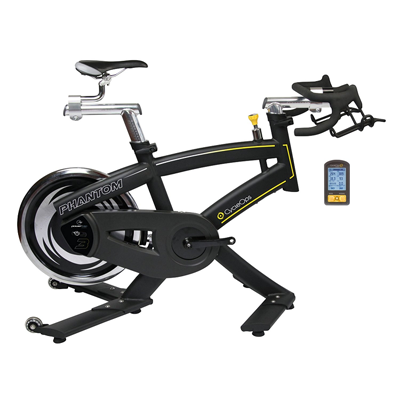 Buy CycleOps Phantom 3 Indoor Cycle - FREE SHIPPING! Joule GPS+ cycling computer included to collect data. The Phantom 3 is compatible with most ANT+ CycleOps or PowerTap products, but doesn't work with the CycleOps Cervo (a.k.a. the little yellow computer) or Joule 1.0. Contact us if you have compatibility questions.